Stable and clean power rail signals are the basis for a proper performance of any electronic design. Rohde & Schwarz provides a wide range of benchtop and handheld test solutions for Power Integrity testing. Signals traveling through electronic designs typically get degraded by crosstalk, bandwidth limitations and signal line discontinuities. Take a look at our comprehensive solutions to measure e.g. timing, jitter, return and insertion loss, eye diagram, crosstalk and unwanted signal components. Increasing demands on power distribution networks have resulted in smaller DC rails, as well as a proliferation of rails that ensure clean power reaches the pins of integrated circuits. Meet the challenge of measuring ripple, noise and transients on today’s low voltage DC power rails with unknown precision and speed. A key challenge for embedded devices with DDR memories is to maintain signal integrity in the presence of power and ground rail fluctuations. This becomes even more important as supply voltages decrease and switching speed increases leading to tighter power rail tolerances and jitter requirements. Rail voltages are getting smaller, and tolerances are decreasing. As a result, making accurate power rail measurements has become much more difficult. In the past, any scope was able to measure ripple on historical 5 V rails with 10% tolerance, since the 500 mV requirement was well above the noise level of the scope. This guide describes five tips for making accurate power integrity measurements with oscilloscopes. Power supply design engineers often face the challenge of measuring the power supply rejection ratio or power supply ripple rejection (PSRR) of their design. The PSRR is an important parameter to indicate the power supply’s output stability. It provides information about the influence of input voltage variations on the stability of the output voltage. 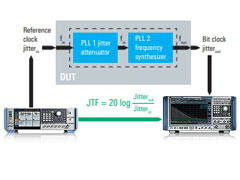 Increasing data rates in high-speed digital designs and wireless communications require SerDes PLLs and clock synthesizers with low additive phase noise and high jitter attenuation. Modern designs often follow a two-stage architecture, consisting of a jitter-attenuator and a frequency-synthesizer stage. Due to their high phase noise sensitivity, phase noise analyzers are the instruments of choice for these tests. To stimulate the PLL, an additional signal source with ultra low phase noise is required. With continuously increasing data rates, signal integrity aspects of high-speed digital designs and the components used become more and more challenging. 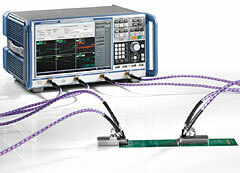 Particularly at higher data rates, vector network analyzers (VNA) are increasingly replacing traditional time domain reflectometry (TDR) setups for testing passive components such as connectors, cables, PCBs, etc. 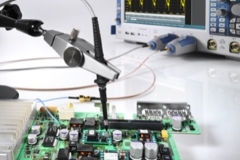 Users benefit from the higher accuracy, speed and ESD robustness of the VNA, making the VNA the instrument of choice in this field.